If you have mustered the nerve to go after the ultimate ocean predators, we have the perfect tour for you! Key West Shark fishing and Key West Tarpon fishing is best after the sun goes down. This tour leaves at sunset to catch the very time when the fiercest tarpons and sharks become active! Imagine yourself on deck of a great fishing vessel with an expert crew, perhaps a cold beer by your side, while the sinking sun turns the sky and waters into a canvas of glittery gold and red colors. A tropical sunset is a natural spectacle to remember! But at the center of this trip are the sharks and tarpons! Tarpon Fishing Key West will leave you sitting on the edge of your seat the whole time. Watch them feed on the water surface as the sun goes down. And of course you need to watch your rod tip. Is it shaking yet? Then you will have to get ready for the ultimate battle, perhaps with a 120-pound silver king? This tour is the absolute ultimate fishing adventure! We leave at sunset to catch the sharks and tarpon when they become active for the night. You will be stunned by the sheer size of these ocean predators. Our sharks can be as long as 10 feet and species include bull, lemon, hammerhead, and black tip sharks. Perhaps you are more interested in tarpons? Then prepare yourself for a battle with a tarpon weighing anywhere between 75 and 160 pounds! 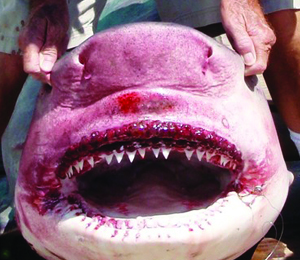 This Key West shark fishing adventure is not for the faint of heart! Battling a predator is the most thrilling of all fishing adventures and pulling your catch into the boat is an unforgettable experience! Everything you need is provided for with or charters, including the most experienced and enthusiastic captains you could find anywhere. Your tour is bound to be a great success, so secure your charter boat today! I have been to the Bahamas many times, but Sunset Shark and Tarpon is one of my favorite trips! It includes everything that everyone should do here. As a Bahamas veteran, I can say only the best about this experience!